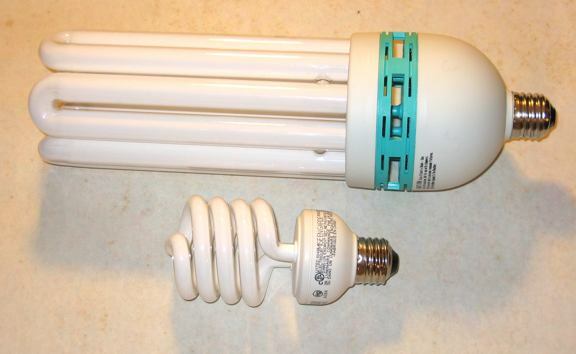 Compact Fluorescent Lamps (CFL) are the best thing since sliced bread. 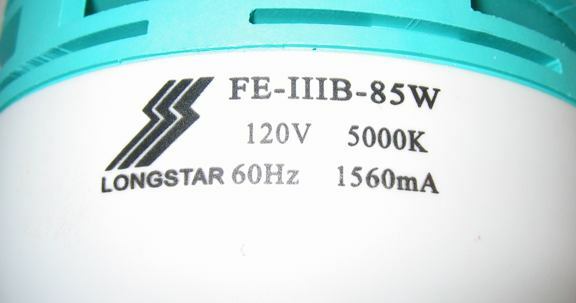 Super-low power consumption, a wide variety of color temperatures and very long life. For me, there is just one problem - for my tired old eyes, they're not bright enough. Leave it to the ChiComs. 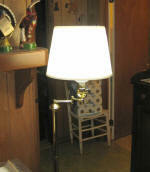 light output like a 300 watt incandescent lamp and over a foot tall! That's what I call a BACFL! A common ordinary Jar Lid. Note the cute country scenery - A Vital Ingredient!! The Jar lid is attached to the BACFL with a few spots of RTV or equiv. 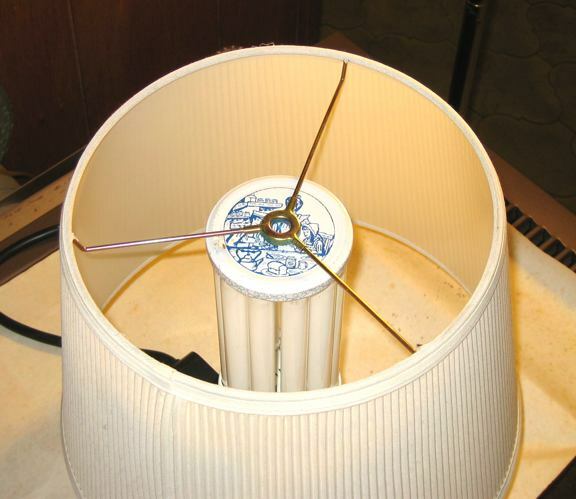 Next, we simply set the lamp shade on the jar lid. 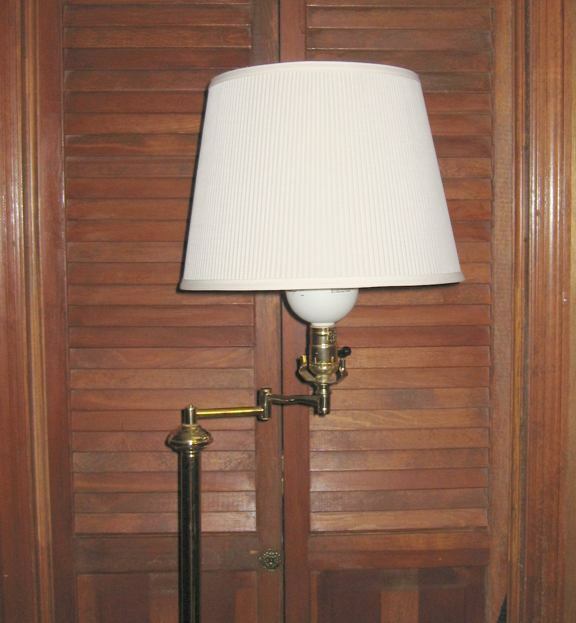 If one wanted to be fancy, a bit of lamp all-thread could be attached but I chose to use a dab of RTV, topped by the original shade nut. The finished product. Finally! A lamp that I can read by that doesn't make the power meter dance a jig! http://www. 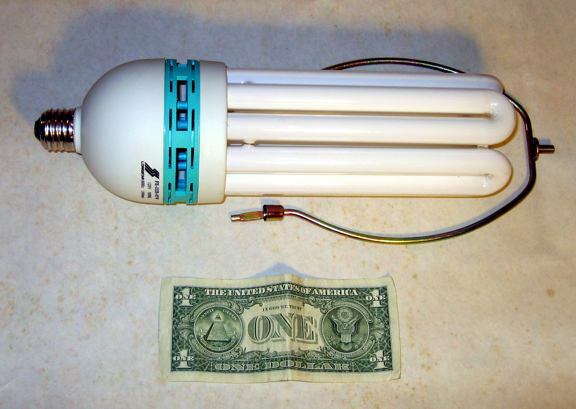 Buylighting.com has a number of other interesting CFLs including The Mother of All CFLs  (This thing is as big as a basketball, complete with mogul base and a cute little fan! 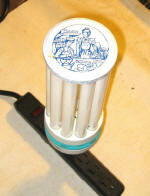 ), Color CFLs and a CFL that actually kills odors. Look for a review of this one elsewhere on this site. If you need colored lights, the Color CFLs have to be seen to be believed. They're made with phosphor coated classic colored neon tubing. The color intensity is electrifying, though one of the batch I bought wasn't coated with phosphor very uniformly. So it goes with ChiCom products. I've only ordered once from this vendor. The order was processed promptly and the goods arrived undamaged. This Mother of All CFLs actually has a great application. 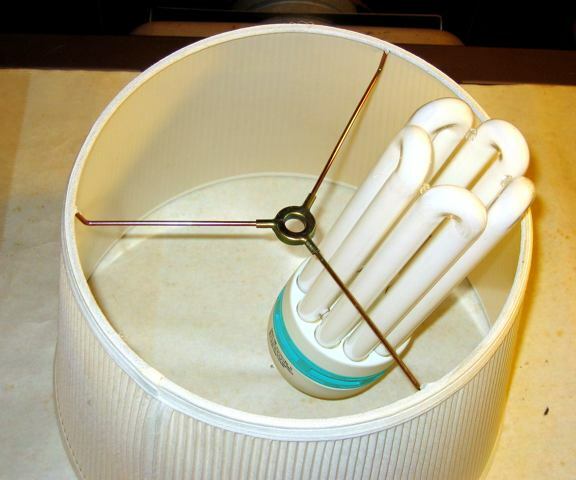 It is a great energy saving replacement for either a 175 watt or 400 watt mercury vapor lamp in a security light. Simply remove the ballast from the fixture, connect the mogul socket through the photocell to 120vac and there you go. 400 or 175 watts down to 85 watts with at least as much light. I've ordered more of these and am installing them in all my security lights. I suggest gluing a bit of air filter material over the cooling air intake to keep the bugs out. You must remove the existing ballast from the fixture. If you don't, all the blue smoke will leak out of your shiny new Mother of ALL CFLs. Update 12/13/2011 - Buylighting.com changes their product URLs so none of the links listed to the left lead to the product. It's not hard to find them, however. Meanwhile those Chinese CFL munchkins have been working hard. 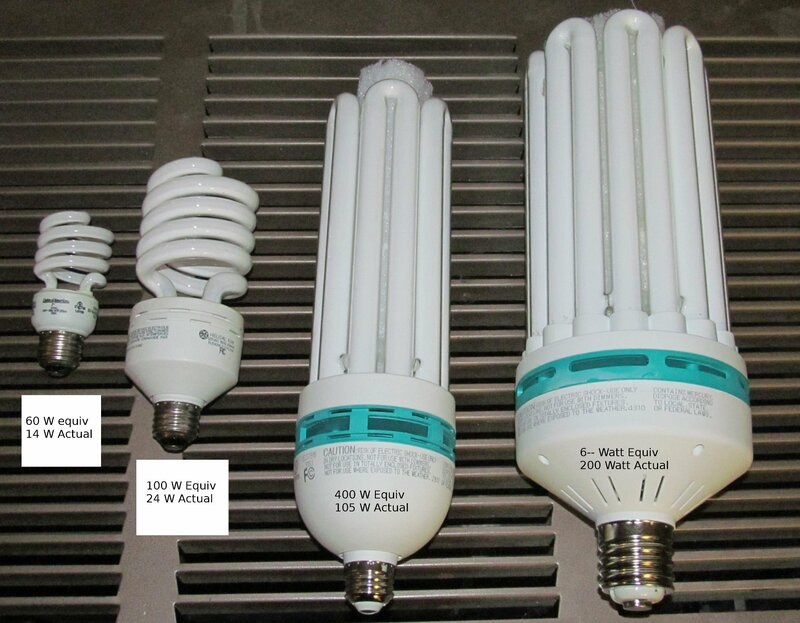 The CFLs just keep getting bigger and bigger. Check out my latest acquisitions vs the ones one can buy at Wallyworld.